Michael Clayton is a 2007 American legal thriller film written and directed by Tony Gilroy and starring George Clooney, Tom Wilkinson, Tilda Swinton, and Sydney Pollack. The film chronicles the attempts by attorney Michael Clayton to cope with a colleague's apparent mental breakdown and the corruption and intrigue surrounding a major client of his law firm being sued in a class action case over the effects of toxic agrochemicals. The film received critical acclaim and was nominated for seven Academy Awards, including Best Picture, Best Director and Best Original Screenplay for Gilroy, Best Actor for Clooney, and Best Supporting Actor for Wilkinson, with Swinton winning the award for Best Supporting Actress. Michael Clayton is a "fixer" for a prestigious New York City law firm, using his connections and knowledge of legal loopholes for clients' benefit. One night he receives a call about a client who was involved in a hit-and-run accident, leaving his high-stakes poker game to attend to the matter. Later he drives into the countryside and in the early morning he suddenly stops to approach a group of horses in a field, when a bomb detonates in his car parked nearby. The film flashes back to four days earlier, as one of the firm's leading attorneys, Arthur Edens, has a manic episode in the middle of a deposition in Milwaukee involving a multibillion-dollar, six-year-long class action lawsuit against client U-North, an agricultural products conglomerate. Michael arrives in Milwaukee and bails Arthur out of jail after finding out he is no longer taking his medication, but Arthur escapes from their hotel room in the middle of the night and returns to New York. The viewer learns that Michael is $75,000 in debt from a restaurant investment he entered with his brother Timmy, which collapsed when Timmy used the restaurant's funds to fuel his drug habits. Michael, having gone to a loan shark to raise the money, is held responsible for the debt and given one week to come up with the money. Michael asks his boss Marty Bach for a loan to cover the expenses; Marty insinuates that if Michael is successful in containing Arthur then he can secure the loan. Karen Crowder, U-North's general counsel, discovers that Arthur had come into possession of a confidential U-North document, a 1991 memo detailing the company's decision to manufacture a weed killer it knew to be carcinogenic. Karen brings this to the attention of U-North's CEO Don Jeffries, whose signature is on the 1991 memo. Don puts her in contact with two hit men secretly on retainer. She contracts them to follow Arthur and bug his apartment and phone. Michael finds Arthur on a Manhattan street and confronts him about calls he made to Anna Kaiserson, one of the plaintiffs in the U-North suit. Knowing that his contacts with Anna were secret, Arthur realizes that his calls are being monitored. That night, Arthur calls his own voicemail at the firm and, knowing that his phone is bugged, brazenly reads from the 1991 memo. When the hitmen tell Karen that Arthur is building a case to expose U-North, she approves of their taking "drastic measures." The men break into Arthur's apartment and murder him in such a way as to make it look like an accidental drug overdose or suicide. At first devastated on learning of Arthur's death, Michael becomes suspicious when he discovers that U-North was planning a settlement just a few days before, and that Arthur had booked a flight to New York for Anna. He finds Anna and learns that no one knew of her conversations with Arthur, not even her attorney, yet Michael's firm somehow knew of Arthur's conversations with the U-North plaintiffs. With the help of Michael's other brother Gene, a police detective, Michael gets access to Arthur's sealed apartment and, finding a bottle of champagne and two glasses in the refrigerator, suspects Arthur arranged to meet Anna. There is also a copy of Realm and Conquest, a fantasy novel which Michael's son Henry had recommended to both Michael and Arthur, with several pages evidently highlighted and annotated by Arthur, among which is a receipt from a photocopy shop being used as a bookmark. The two hitmen, who have been trailing Michael, call the police when they see him enter the apartment. Michael is caught and arrested for trespassing, but Gene bails him out. Using the photocopy receipt, Michael discovers that Arthur had ordered 3,000 copies of the confidential U-North document. Michael takes one copy of the document with him. The hitmen also obtain a copy, which they provide to Karen. Michael is about to show Marty the document in his possession, but before he can do so, he is offered a renewed employment contract as well as the $80,000 he had requested to cover his debt. As a condition, Marty's associate, Barry Grissom, operating on the assumption that Michael may be shaking down the firm based upon what he has found out about U-North's activities, imposes a confidentiality agreement on Michael to prevent him from divulging any information that might damage U-North's case. This reveals to Michael that Marty and Barry already know about U-North's cover-up. One of the hit men rigs Michael's car with a bomb, but is forced to leave the job unfinished when Michael suddenly abandons his poker game after receiving a phone call summoning him to meet the hit-and-run client. He is followed by the hit men, who have trouble tracking him, but eventually get close enough to detonate the radio-controlled bomb. When the bomb explodes, Michael runs back to his burning car, throws some of his personal effects into it, and escapes into the woods. Everyone at the firm presumes that Michael died in the explosion. Later, at a U-North board meeting at the New York Hilton Midtown hotel, Karen proposes that the board approve a new settlement in the class action lawsuit against the company. She leaves the room to let the board of directors deliberate. She is shocked when Michael confronts her in the foyer, since she believed him to be dead. He informs her that he has possession of the U-North memo, and knows about her role in Arthur's murder and the subsequent attempt on his own life. He goads Karen into offering him $10 million for his silence. Karen reluctantly agrees, whereupon Michael reveals that he is wearing a wire. Michael leaves as the police arrest Karen and Don. Getting into a cab he tells the driver "Give me $50 worth. Just drive". George Clooney as Michael Raymond Clayton. As the "fixer" for Kenner, Bach, and Ledeen, it is his job to clean up messes for the law firm. He refers to himself as a "janitor", and does not enjoy his job. Denzel Washington turned down the title role and later regretted it. Michael O'Keefe as Barry Grissom, who works closely with Marty at the law firm, and imposes conditions on Michael for the $80,000 "bonus"
Katherine Waterston, in her feature debut, as "Third Year", which likely refers to the number of years she has been an attorney at Kenner, Bach, and Ledeen. A "third year" staffer is considered to be a fairly junior attorney at a corporate law firm. The film premiered August 31, 2007 at the Venice Film Festival; was shown at the American Films Festival of Deauville on September 2, 2007; and at the Toronto International Film Festival on September 7, 2007. It opened in the United Kingdom on September 28, 2007, and at the Dubai Film Festival in December 2007. The film opened in limited release in the United States on October 5, 2007, and opened in wide release in the US on October 12, 2007. The film grossed $10.3 million on the opening week. It was re-released on January 25, 2008. The film has grossed $49 million at the North American domestic box office, and a total of $92.9 million worldwide. The film was released on DVD and Blu-ray Disc on February 19, 2008. The DVD contains deleted scenes and a commentary by writer/director Tony Gilroy. On March 11, 2008 the movie was also released on HD DVD. 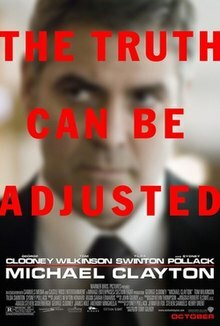 Michael Clayton received critical acclaim, and has a "certified fresh" score of 90% on Rotten Tomatoes based on 198 reviews with an average rating of 7.6/10. The critical consensus states: "Michael Clayton is one of the most sharply scripted films of 2007, with an engrossing premise and faultless acting. Director Tony Gilroy succeeds not only in capturing the audience's attention, but holding it until the credits roll." The film also has a score of 82 out of 100 on Metacritic based on 36 critics indicating "universal acclaim". Owen Gleiberman of Entertainment Weekly gave it an "A" saying that it was "better than good, it just about restores your faith". Roger Ebert gave it a full four stars and Richard Roeper named it the best film of the year. It was also Richard Schickel's top film of 2007, and he called it "a morally alert, persuasively realistic and increasingly suspenseful melodrama, impeccably acted and handsomely staged by Tony Gilroy". Time magazine said that "Michael Clayton is not an exercise in high-tension energy; you'll never confuse its eponymous protagonist with Jason Bourne. But it does have enough of a melodramatic pulse to keep you engaged in its story and, better than that, it is full of plausible characters who are capable of surprising—and surpassing—your expectations". Original Motion Picture Soundtrack: Michael Clayton was composed by James Newton Howard and released on September 25, 2007 on the Varèse Sarabande label. The soundtrack was nominated for an Academy Award for Best Original Score. ^ a b Michael Clayton at Box Office Mojo. Retrieved October 21, 2013. ^ "Michael Clayton". Turner Classic Movies. Retrieved March 24, 2016. ^ Davis, Edward (26 September 2012). "Denzel Washington Turned Down 'Seven' & 'Michael Clayton,' Javier Bardem Passed On 'Minority Report'". IndieWire. Retrieved 13 May 2017. ^ "Michael Clayton". Rotten Tomatoes. Retrieved October 21, 2013. ^ "Michael Clayton". Metacritic. Retrieved October 21, 2013. ^ Ebert, Roger. "Michael Clayton Movie Review & Film Summary (2007) | Roger Ebert". www.rogerebert.com. Retrieved 2016-12-03. ^ a b "Richard Roeper's Best of 2007". Internet Movie Database. Retrieved October 21, 2013. ^ a b Schickel, Richard (December 9, 2007). "Top 10 Movies (Richard Schickel)". Time. Retrieved July 1, 2010. ^ "Metacritic: 2007 Film Critic Top Ten Lists". Metacritic. CBS Interactive. Archived from the original on February 23, 2008. Retrieved February 25, 2008. ^ "The Edgar Allan Poe Awards". Book Reporter. Archived from the original on January 2, 2010. Retrieved November 30, 2010. ^ "Allmusic: Michael Clayton (Original Score)". Macrovision Corporation. 2008. Retrieved February 24, 2008.